The Manchester or ‘Log End’ dartboard is unique by today’s modern standards. This board is handmade, double-sided and made from wood. It was made using UK Elm however, the UK suffered from the spread of Dutch Elm Disease that wiped out millions of Elms by the mid 1970’s. Other soft woods such Poplar have also been used to make the board. The Manchester Log-end Dartboard is said to be the hardest dartboard to play on due to its small playing area. The dartboards are dyed jet black, and only measure 10 inches (254mm) in diameter (wire to wire). The doubles are 1/8 inch (3.2mm) wide. Hence the difficultly as these are hard to hit. The Manchester Log-end Dartboard is still played upon in some part of Manchester today, however, there seems only one person still making them, Dave Mealey. I guess others may have taken up the baton since this picture was taken. However, Dave has said he makes up to 400 dartboards per year and all by hand. The dartboard itself has a unique numbering system and is quite different from the standard ‘clock’ / ‘London’ dartboard most of us have played on and we see on TV. 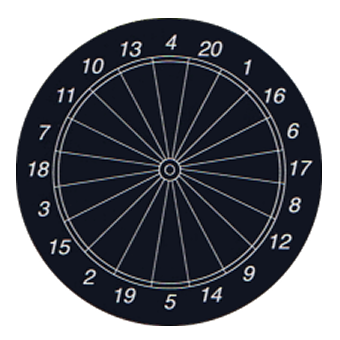 Although there are still 20 segments numbered 1-20 with a inner and outer bullseye, plus a double ring, the order of the numbers are totally different from any other dartboard. The boards are dyed jet black so that the embedded metal scoring segment dividers and numbers can easily be seen. The board also need to be kept immersed in water when not in use otherwise the board will dry out and split only removing for an hour or two prior to play. It takes Dave about two hours to make each board but how long will the Manchester board be commercially available may depend on Mr Mealey and if anyone else wishes to continue making them. Due to the nature of how the Manchester Log-end Dartboard is made supply is difficult to find and because these board need to be kept wet the turnaround from manufacture to user is also fast. The dartboard should hang securely from a wall so that the height of the centre bull is 5ft 3ins / 161cm from the floor. The toe-line or Oche 7ft 6ins / 229 cm shall be clearly marked and should be at least 18ins long. The toe line can be just a painted line on the ground or a securely raised line indicator such as a piece of wood or metal. The latter is preferable as the thrower has firm edge to rest his/her foot against. If you know of any other supplier of the Manchester dartboard please let me know. Contact. 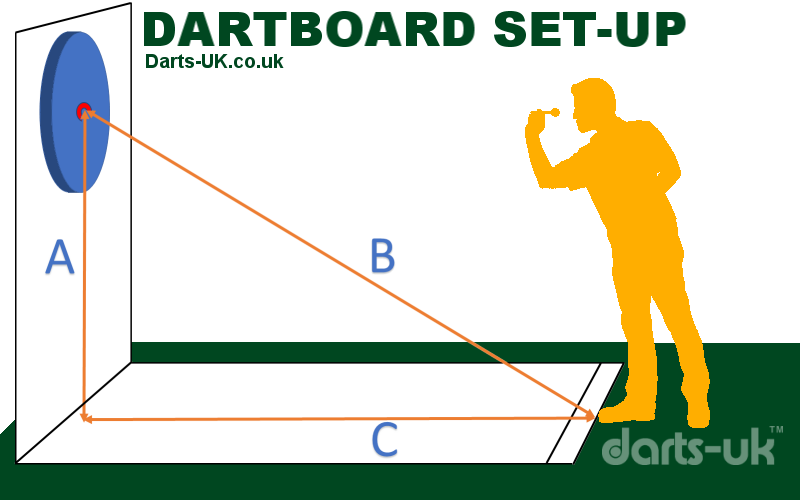 Each player throws in turn, if number one is hit with the first dart they progress to number two and so on. If the player should hit the double of the number he they are throwing for then they progress to the number exceeding the value of that double (if possible). Hitting double one (2) when throwing for one moves the player to number three. Should the player hit double three when throwing for three (6) they more straight to number seven. Once all the numbers have been hit the first double the player hit must be hit again before hitting the centre bullseye. If no double was hit during the progress around the board then the player must hit double 20 before hitting the bullseye. In the case of this game the Bullseye and outer-bullseye both count as a single target. It isn’t uncommon for the centre bullseye to be removed. However, doing so prevents a 301 game being played fully. See local league rules for further information. Generally, each player’s score is must start and finish a game with a double (The narrow outer ring of the board). Competition games, however, are usually played with a straight start (no compulsory double) but with a compulsory double to finish. The first throw is deducted from the player's start number e.g. 301 and then from the subsequently reduced total. The scorer should show both the score obtained for the throw and the reducing total remaining. The inner bullseye (50) counts as double of (25) the outer bullseye. Also see your local league rules for further information.